Wore it to the office yesterday with skinny jeans and cork wedges. It was the third work day for me, and the third new outfit. She: "Oh, another one? I hate you. Love the color"
Me: "thanks, I think. It was pretty easy"
She: "Seriously? Just once I would love to hear you say 'Target, sale rack' like most people"
"Because then I could swing over to Target and grab one, or we could at least go shopping together. Now you've go your own little clothing island going on and nobody's invited." "The rest of us just sail by on the department store ferry and wave at you and your perfect fitting clothes." The coffee was done, she rolled her eyes and went back to her office (desperately crying out for and FBA and a shorter hem). Its easy to feel like the weird little 4H kid in 4rth grade when you grow up in home-made clothes. Aren't we trained to just say thank you instead of admitting that we made it, by hand, and we loved every minute. What do you say when someone asks you where you got that dress? For one thing, I am rethinking the way I thought that garment sewing was perceived. Maybe they really are just a little bit jealous. 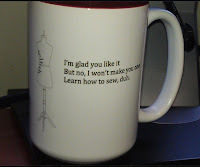 Either way, I'll keep sewing, wearing my sewing and bragging about it. Maybe I'll stop walking around with the cup so much, but I'm keeping it! What do you say when someone asks you where you got something that you made? Do you dodge the question? Do you lie? Love the simple top. I could have bought it at Target, but then it wouldn't be out of this stretch silk. Its really awesome. OK, I made it for comfort, not flattery or figure disguising curves and I nailed it! One thing I gained from Me-Made-May Flicker photo group is that I need more casual, weekend clothes and this is a great addition. Hmmm, interesting conversation! On the one hands sounds like she was complimenting you, in a funny way. People I know don't ask about my clothes since I'm known for making them all and considered a bit weird I suspect. I tend to dodge the questions if they do. I usually say, 'thanks, I made it, so you could make one too- anyway you'd like! '....mostly to stall the 'make me one?' part of the conversation. MY Motherinlaw still thinks we must be struggling horribly if it's sewn, so I avoid answering! I get the jealous eye rolling, too, and I would not carry that coffee cup around. People around here can carry concealed guns anywhere not posted, something I can never quite forget. Maybe your co-worker could take sewing lessons.....just a thought :). If someone compliments something I'm wearing I say Thank You. If they ask me were I bought it then I tell them I made it. Great top and the color is very pretty!!!! Lovely top. Just perfect in that fabric. If I am complimented on a garment I just say thankyou, I am not often asked nowadays where I got clothes. In my last job everyone assumed I made it as I never make a secret of my sewing or knitting . I admit to sewing clothes quite happily if anyone asks me (and sometimes even if they don't). It is very interesting to see the different reactions people have to sewing your own clothes and it sounds like your colleague is impressed with your skills...as well she might be given the quality of your work. Most people I work with and talk to on a regular basis know I sew. I've put way too much time and hard work into developing these skills to just hide them. If they start bugging me about alterations or making them something I refer them to a housekeeper here that is actually willing to take on extra jobs like that. A win-win scenario for everyone! What a fantastic conversation to have. If I am complimented I say thank you, if they ask where I purchased it from, I say I made it. Such a pretty coloured top and looks very comfortable. Cute top! And that mug is awesome! 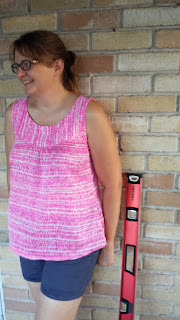 I have had great comments on my clothing to which I thank them for the compliment and share my enthusiasm for sewing and encourage them to give it a try. I am getting better at saying no to those who ask me to make something for them. I have even given "lessons"(they pick a project and I walk them through the process but they do the work) to friends so they can see the work that goes into a garment and they have never asked again after that. But mostly I have had good experiences. This past weekend my husband got a big kick out of counting the compliments I received on my self made skirt. Counting seven in one day. (all strangers) It usually sparks interesting conversations with people, I especially love the ones with older folks reminiscing about the times when they used to sew as well.